One of the primary drivers of motivation that I use to make so much content on a weekly basis is because I want to change the way in which hockey athletes and hockey coaches view strength and conditioning program design. There are an incredible amount of articles, videos and social media posts in existence today from “experts” in the hockey training world who still have yet to master the basic principles of program design and sports physiology. All of these statements are complete and utter nonsense, they lack (in an extreme way) the real knowledge behind what drives real performance out on the ice. The thought alone that somebody could dismiss an entire program or periodization strategy based on a simple statement like one of the above is absurd. If training methodology was this simple there wouldn’t be thousands of studies performed every single month – not that the people making these statements are away of any of this research anyways. Just because some workouts you see online regarding hockey performance contain more total body power type movements, it doesn’t mean that isolation exercises don’t have a place in sport specific training. Since isolation movements do not directly mimic certain movements you do out on the ice, the performance benefits that they can offer you can be a little less obvious. This has lead plenty of hockey coaches to think that isolation work is not beneficial for hockey athletes, to the point where they make big claims online about it not being of value at all. 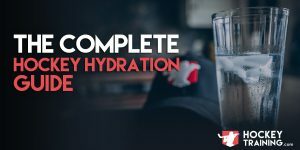 When you’re taking a look at a complete approach to hockey performance enhancement from strength and conditioning, you quickly realize that it’s not just about getting stronger and more powerful. Performance enhancements can and will come in the form of increasing your bodyweight by increasing your muscle size, this is what hypertrophy-based programming is all about. Using some isolation work (and, *gasp* even machine work) within these select hypertrophy phases can help you get bigger which will improve your overall performance in hockey by creating a measurable increase in your ability to produce diagonal and horizontal forces when on the ice – such as when you’re body checking someone, fighting for the puck, winning a battle in the corner, or taking a shot. In that, one of the factors that determines your level of stability and strength on your skates while simultaneously being able to express maximal force is how big you are. Your body mass contributes to your stability because heavier bodies are harder to move. Lighter bodies are the opposite, they are moved much easier and are less stable – which is a very clear disadvantage in a contact sport like hockey. Beyond this, the bigger you are, the greater potential for force you can generate because you will have a larger foundation and amount of muscle fibers to work with. This helps you both create and resist forces at a much higher level. If this wasn’t enough, isolation work is one of the best things you could ever do to reduce your injury risk out on the ice. If you took two groups of hockey athletes, put them both on the exact same program design, but, added isolated hamstring strength training to Group A and not Group B – Group A would suffer much less knee and hamstring injuries throughout their career. Moreover, hamstring strength is associated with vertical jumping power, horizontal jumping power, and sprint speed – all of which have been connected to on-ice skating speed. So, why the heck wouldn’t I do isolated hamstring work to benefit all of the above factors? Research has shown us that a more comprehensive approach to hamstring training must be made where you should be incorporating at least one exercise that is hip focused (e.g. a Romanian deadlift) and one exercise that is focused on the knee joint (such as a lying leg curl machine). 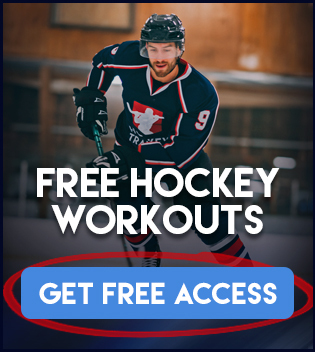 Each offers complimentary training benefits because they are different in their activation and adaptation in the body, yet, “functional” training coaches would dismiss the isolation work simply because it’s isolated – what a sad excuse of a complete approach to hockey training. The biggest irony here is that isolated hamstring work has been connected to all of those benefits, and yet they deem it as somehow not functional? Just sticking to the “big” lifts is not a fully comprehensive approach to the training stimuli needed to optimize hockey performance. Another great example of isolation work for hockey athletes would include training the adductors. One study found that professional hockey players were 17 times more likely to sustain a groin injury if their adductor strength was less than 80% of their abductor strength. Yet, it’s not uncommon at all that you see coaches totally ignore isolated groin work, even when the research suggests otherwise. To reach greater levels of muscle activation in the adductors, you need to train them directly and not rely on movements such as lunges or squats. These above principles do not apply only to your hamstrings and groin, they apply across your entire body and an understanding of biomechanics and hockey specific program design would tell you that. 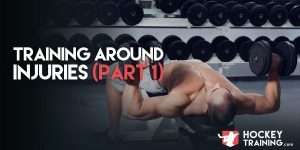 I hope this article pointed out to you today that although the big movements do in fact give you the greatest return on investment in regards to time-invested, that statement should not represent the idea that isolation exercises are useless – because they definitely aren’t.